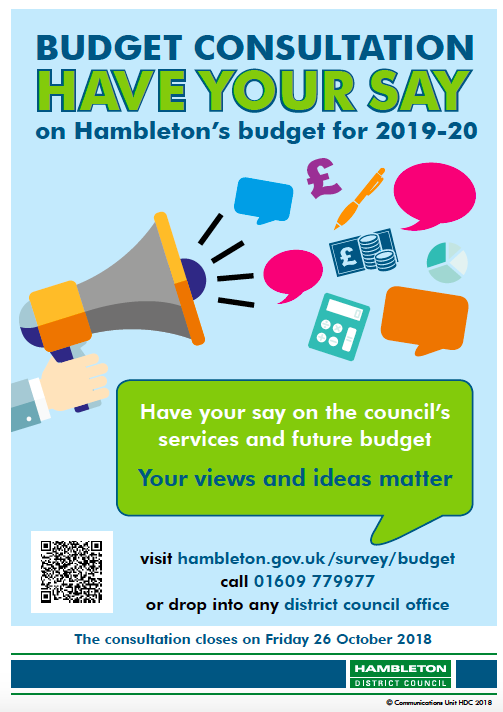 Hambleton District Council is consulting on its budget and the services it provides for next year (2019-20). To help shape the budget proposals the council is inviting you to have your say through this consultation until 26 October 2018. Your opinions, views and ideas matter. In February 2019, the council has to approve a budget and, to help inform that decision, you are encouraged to have your say on where the council’s funds should be used to support services.This budget consultation is a key part of this process. It is a statutory requirement that business rate payers are included in the budget consultation process and therefore a meeting for local businesses will be held on Tuesday 4 December 2018 from 2-4pm at the District Council offices in Northallerton. If you would like to attend this meeting please contact carol.newman@hambleton.gov.uk to reserve a place. In addition to the meeting above, there are several ways for you to tell us your views. Get your business involved and have YOUR say.